Three dead and five injured in explosion in Jaffa building, believed to have been caused by illegal gas tank in nearby store. 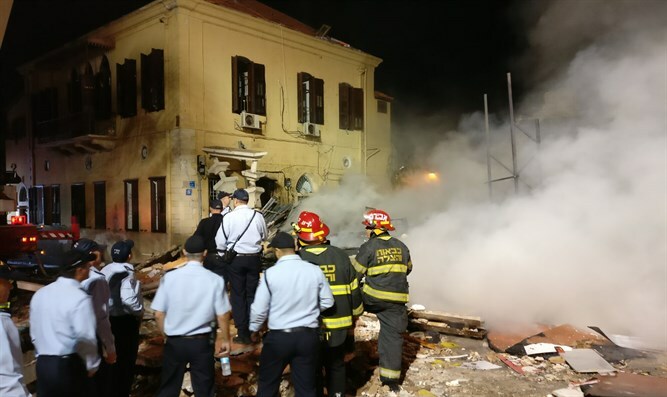 Three people were killed on Monday evening when a building in Yefet Street in Jaffa partially collapsed after a large explosion there. Two of those killed have been identified as Rimon Huri from Jaffa and Ali Abu Jamea from Tayibe. The name of the third person killed in the blast has not yet been cleared for publication. Police, Magen David Adom paramedics and firefighters who arrived on the scene reported that large parts of the building were on fire. 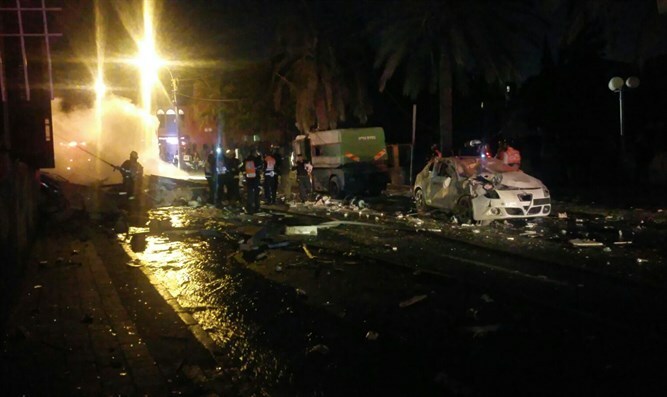 The bodies of two of those killed were recovered from the building which collapsed, while a third person suffered critical injuries and was taken by Magen David Adom paramedics to the Wolfson Hospital in Holon, where he later died of his injuries. Four other people who were lightly injured were taken to the Wolfson Hospital as well. A preliminary investigation by the police found that the explosion took place in a hardware store located next to the building which collapsed. Firefighters believe the explosion was the result of a gas leak in the store, which, they said, was operating a gas tank without a business license. Six teams of firefighters who were summoned to the scene extinguished the flames. As the search and rescue efforts continue on Tuesday, Yefet Street will be closed to traffic between Yehuda Margoza Street and Shivtei Yisrael Street. In addition, the area between the Goldman-Kaufman junction and Yefet Street will be closed. Traffic police will be deployed along the Sderot Yerushalayim-Yafo route and direct traffic. The police recommend that drivers refrain from approaching Yefet Street. United Hatzalah volunteers, who were among the first responders at the scene, reported that the fire was widespread and included the building and vehicles nearby. Reports show that there are numerous people trapped inside awaiting evacuation by the Fire and Rescue Crews who were on scene and working to combat the flames and evacuate those trapped inside. United Hatzalah volunteer Benny Mizrachi reported from the scene, "I together with other United Hatzalah volunteers arrived here at Yefet Street where a building is burning and numerous people are trapped inside. We are currently awaiting the okay from the Fire and Rescue crews at the scene who are working to evacuate those trapped inside to begin treating those who need medical attention as quickly as possible."